Turn your backyard into a finch feeding haven with the Gardman Yellow Flip Top Mesh Thistle Seed Bags. These convenient and charming bags bring bold color to your bird garden, while helping small songbirds remain fed. 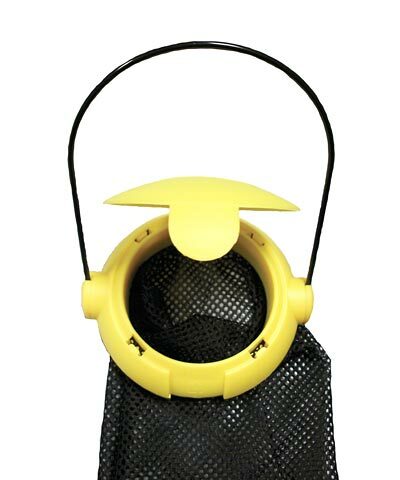 A yellow, plastic circular top on each unit brings attention to your garden, and a black, mesh seed bag hangs beneath it. This bag accommodates 0.7 quarts of thistle seed, which clinging birds can reach through the small openings on the mesh. The plastic caps flip open for easily refilling the units, and snap closed to protect feed from rain. Hang each unit using its attached, metal loop, so finches have a bevy of dining spots. Offer thistle to several birds with these Yellow Flip Top Mesh Thistle Seed Bags. Note: This case pack includes 4 of the Gardman Yellow Flip Top Mesh Thistle Seed Bags. Capacity: 0.7 qts., 1 lb.